Lyrics written by me, music composed and performed by my husband. This is our first collaboration on a poetry recitation with original music, on a health theme that we both care about—gluten. Hmmm…. those yummy bread and pastry! The gluten has invaded, so easy! Gluten, gluten, what is it in Latin? No other word than glue! Keep your daily bread, go ahead! Eating healthy requires quite a bit of work. From grocery shopping to washing, chopping and cooking, every step takes time—something a busy working person might find to be a burden. Most of my friends who have once been inspired to eat more healthily, got discouraged when they realized how much time and energy it would take to prepare meals for themselves day in and day out. The food culture where I live, Hong Kong, has stooped to such a level that I dare to say that the majority of the people do not take charge of what they put into their mouth. We are what we eat, hence, I see trouble down the road with their health. Domestic helpers are a norm in this society. They do the grocery shopping and cooking on top of cleaning and taking care of kids and pets. Now, one would be lucky enough to get a helper who is good at cooking. To find one who knows about the nutritional value and how that translates into physical health would be like finding a needle in a haystack. If one doesn’t have a domestic helper, no worries. There will always be a cheap fast food joint around the corner that caters to a Hong Konger’s East-meets-West taste. Of course, if one is better off, one can find a gourmet restaurant in just about any spot, and visit one every day. Another option is that mama mia would cook for live-at-home children, including adult children. In neither of the three cases is real nutritional knowledge injected into the dishes. One might say the third option is better. Sure. But the Chinese traditional dishes do not always produce disease-free people. There are a lot of flaws in a tradition that has gone through thousands of years and not necessarily evolved with time. There is a general lack of science and discrimination, not to mention the safety issues with food from China. Anyway, what I’m trying to get at, is that there is a way to “eat right” (for your type) and still able able to fit that into a busy life. It’s all about planning and, yes, work. But this work can be fun too. 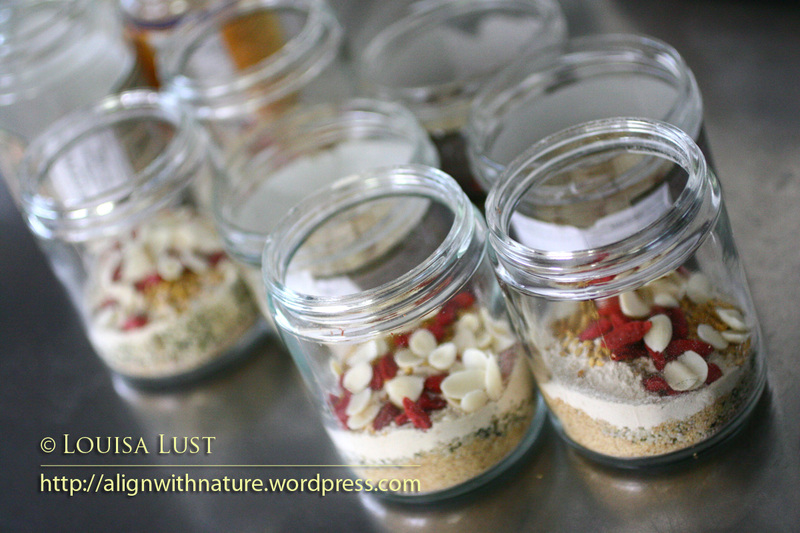 Why not think of food prep as alchemy? 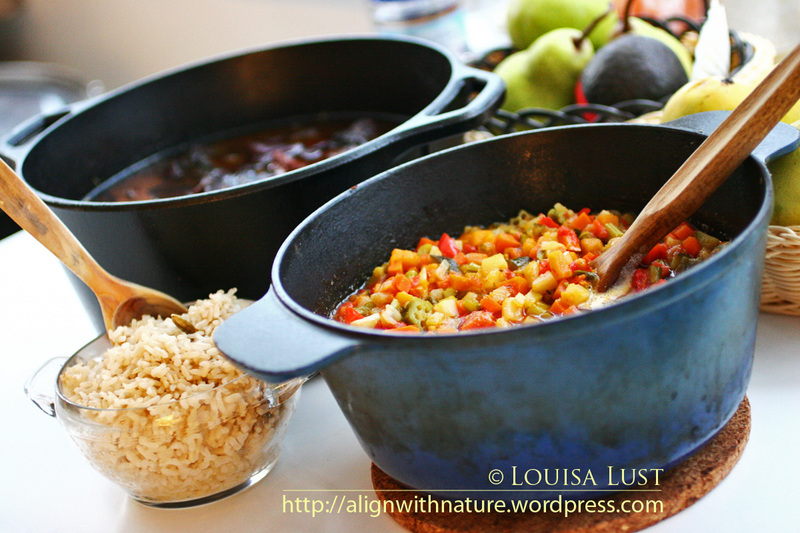 Or painting with colorful raw ingredients? Morning protein shake mixtures consisting of Protein Powder for Type “O”, goji berries, apricot kernals, Trehalose, flaxseeds, chia seeds, hemp seeds and choline. 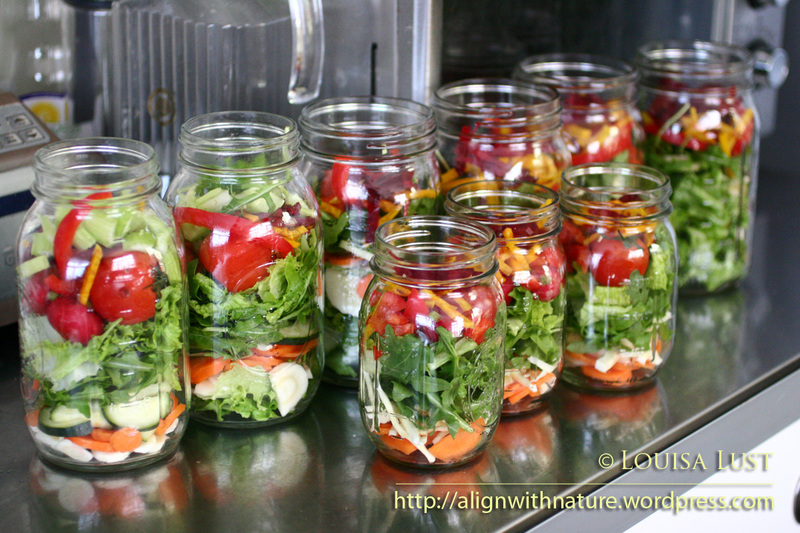 Salad stored in mason jars keep its freshness throughout the week. A big pot of ratatouille customized for my type, to be served alongside meat/fish dishes during the week; a big pot of red wine lamb stew with root vegetables. 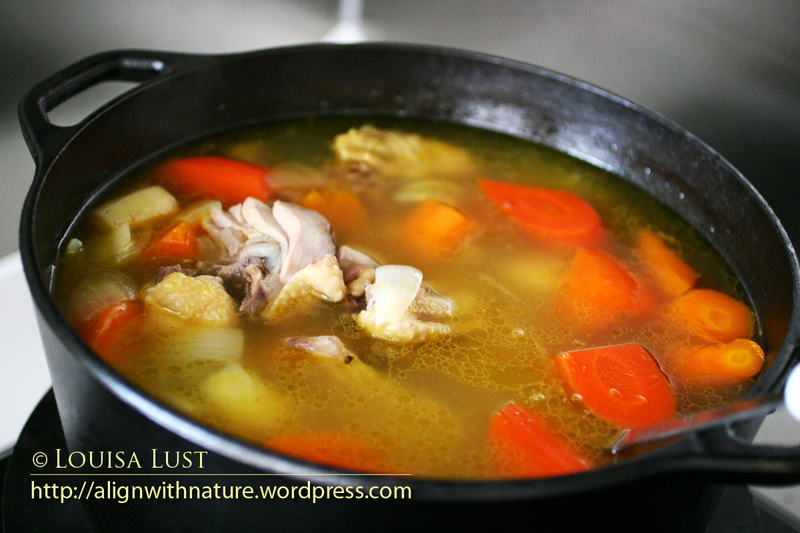 Free range chicken broth with parsnip, pumpkin, carrots, onion and ginger. Pre-mixed breakfast protein and pre-chopped salad in mason jars are great ideas for rushed mornings. All I need to do to prepare breakfast is to cut up two or three pieces of beneficial fruits, dump them into the blender along with the protein mix and some water et voilà! When I head off to work, I just grab one of those mason jars and a can of wild-caught deep sea fish, an egg or some left-over dinner for lunch. As for dinner, which is often pretty rushed for me as I need to go to my ballet training in the evening, I still get to have a nice, sit-down casserole with a baked grassfed steak and ratatouille, or a bowl of chicken broth or lamb stew. I often supplement these dishes with at least 2 cups of steamed organic green-leaf veggies. Typically I devote a full day over the weekend for the bulk of my food prep for the following week. When there is an “overflow” of food, I just freeze it in mason jars. This is very handy as I can then thaw the food on days when I’m too busy to cook.